Update: July session spots are filling up fast! Only a few left. Register now!! It is so important for young girls to be confident in themselves and develop a healthy body image, especially with the ever-changing societal pressures, social media images, and access to technology. This “Confident Girls” group for adolescents 11 to 14 will assist girls in enhancing their self-esteem and address topics including: expressing feelings, decision-making, conflict resolution (dealing with “mean girls”), body image, friendships, coping strategies, and communication. Girls at this age tend to struggle more with personal relationships than their male counterparts. Girls who have high self-esteem feel secure and positive about themselves, confident in their ability to achieve goals, express their feelings, make positive choices, and care about others. During this weeklong group, girls will learn about, engage in discussions, and practice these skills while interacting with their peers. A yoga and meditation session will be included one afternoon led by Dorie Fusaro, ERYT 230 and Jennifer Busco, ERYT 230 of Yo Girl. They will also have the opportunity to provide and receive feedback with their peers in a therapeutic setting while earning rewards for prosocial behavior. Fill out this form for initial registration camp session June 23-27. Fill out this form for initial registration camp session July 14-18. 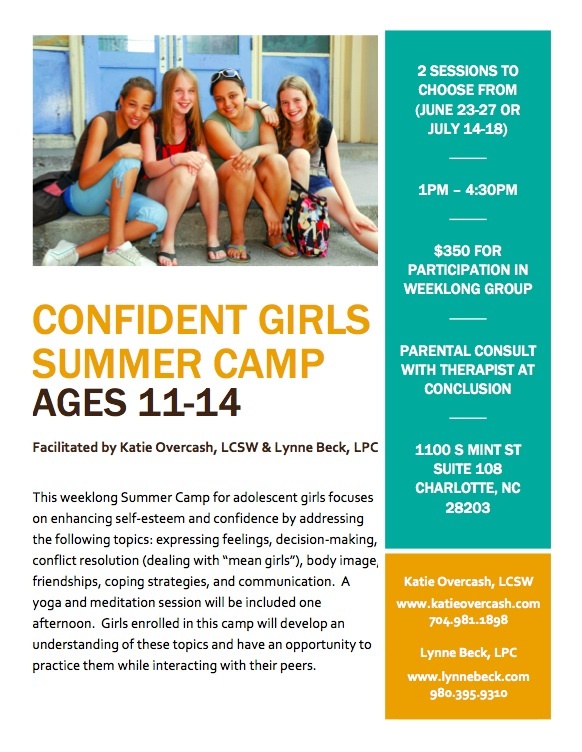 Confident Girls for Adolescents 11 – 14 will be held Monday, June 23rd through Friday, June 27th or Monday, July 14th through Friday, July 18th from 1pm to 4:30pm at 1100 South Mint Street, Suite 108, Charlotte, NC 28203. Download Confident Girls Summer Camp Flyer. 2013 Campers Rave about our camps! Click here. Payment Options: Mail check made out to “OTS” to 1100 S. Mint Street, Suite 108, Charlotte, NC 28203 or click the button below to pay with a credit card. Refunds will only be given up to 2 weeks before camp begins. This entry was posted in Uncategorized and tagged Body image, Camp, Charlotte North Carolina, communication, Conflict resolution, girls, making friends, mean girls, Mental health, peer pressure, self-esteem, Summer camp, teens on January 31, 2014 by katieovercash.